Hi ladies! 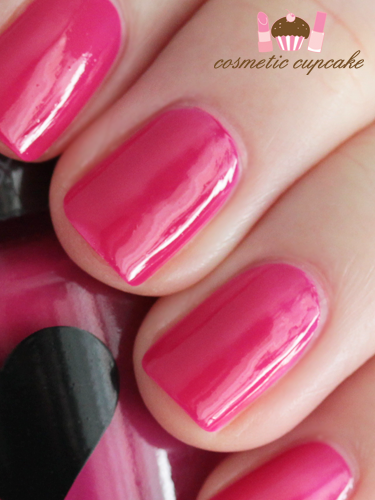 A quick swatch for you today of a gorgeous bright pink from Scandal Cosmetics Heart Lacquer collection called 26 Beach Pink. I was going to do some nail art but I loved the polish on its own so I left it untouched! Beach Pink is a bright rose pink which has an almost neon jelly like finish. It’s a bit brighter in real life on the nail and makes a fantastic shade to brighten the cold mornings or for a bright Summer pedi! My camera didn’t want to capture the shade properly unfortunately. It was super easy to apply like the other Heart Lacquers (love the wide brush!) and it dried quickly. Here I’ve used 2 coats of Beach Pink and 1 coat of Scandal Cosmetics Heart Lacquer top coat for a glossy finish. Details: Scandal Heart nail lacquers are available from Scandal Cosmetics online store for $4. Oh my, this is simply beautiful!! <3 lovely color and so glossy!